Fully revised and updated... Marco Polo maps feature completely up-to-date, digitally generated mapping. 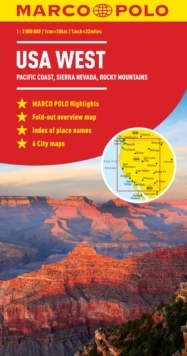 Includes inset maps of: Death Valley National Park, Glacier National Park, Grand Canyon National Park, Yellowstone National Park, Yosemite National Park, Beverly Hills, Denver, Las Vegas, Los Angeles, San Francisco and Seattle. Comprehensive index. The map scale is 1: 2 000 000.